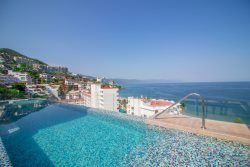 The House is located just a 1 Mile from the Airport at La Marina Vallarta, 50 Meters ahead from the Whale and Neptune´s Monument. Just in front of the Sonora´s Prime Restaurant and Starbucks Marina. The property was completed in Spring 2014 . 3 bedroom, 4 bathroom, Pool and a great view to the Golf Court just in your backyard. The house has a fully equipped kitchen . The living room has a comfortable furniture and a Flat TV Screen 50’’ Smart tv with Access to Wifi. In this room you will also find a 6 people dinning table . The master bedroom features a King size bed and a 50’’ Smart TV with a full bathroom with walking closet. The second and third bedrooms have a Queen size bed with bathroom and closet. Also has a bathroom for visits and a washer machine with dryer included. Tv’s services : Sky System. We have just across the Street about 20 restaurants like Sea Food, Italian, Meats, Burgers, etc. Air Conditioning ,Clothes Dryer,Fitness Room / Equipment ,Garage ,Internet,Linens Provided,Living Room,Telephone,Towels Provided,Washing Machine,Kitchen,Dishes & Utensils,Microwave,Oven,Pantry Items,Refrigerator,Stove,pool,ceiling fans .